At times in our teaching careers, we’ve stepped back and realized we’ve been teaching too much. It happens when we’ve gradually fallen into a cycle of teaching a new minilesson every day, and our conferences and small groups have been introducing new strategies every time we meet with our students. We still check in about old things we’ve taught—maybe during the connection of a minilesson or the research part of our conferences—but the actual teaching is new. There is always more to teach, after all, and we’re trying to make the most of our teaching time by getting to as much as we can. We fall into a trap of believing that more is more. Until, of course, it becomes clear that more usually ends up being less. We look at Sara’s reader’s notebook work from the beginning of the fantasy book club unit and realize that it’s pretty much the same as today’s entries, four weeks later. At the end of the unit of study. Or we listen in on a book club conversation during the third week of book clubs and realize that the club is still popcorning ideas, mostly focusing on the literal events they read. Tell us we’re not alone in having those moments when it seems like all of our teaching—so much teaching—seems to have made no difference. These moments cause reflection and reevaluation of what we’re doing, and we often conclude that we were teaching too much. It makes sense that kids can’t hold on to and try new strategies every day in a way that moves the strategies into habits for them as readers. We wouldn’t be able to do it as adults, either. When we reach a point that we realize our teaching isn’t having the traction we hope or expect, we make a plan for small groups that will gradually release responsibility to our students. These small groups are even more effective when planned at a unit’s outset, to spare yourself the panic we’ve experienced once the unit’s begun or is wrapping up. The small groups that we plan for in this way have a singular focus and provide students with multiple opportunities to work toward independent use of the strategy. Our groups usually meet five times, and we give more scaffolded chances with the work in the early meetings, and end the group with students trying the work independently. 1. Give a performance assessment to the class. We begin by asking students to do some writing about their reading. 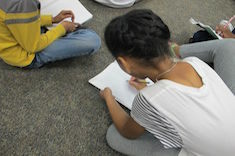 Our performance assessments are usually done in writing, since writing about reading is a way to make students’ invisible reading work visible to us, but if your teaching needs to focus on improving the quality of conversation, you could listen in or record a partner or book club conversation for your performance assessment. We often use our Jot Lot to make the writing we’re collecting easy to look at; it allows us to sort the writing into different categories since it’s on sticky notes, and since the sticky notes aren’t huge, we’re not making ourselves read a ton of writing for each student. The Jot Lot makes grouping the performance assessments as quick and flexible as it can be. If we’re entering into a nonfiction unit, we might read aloud an informational article and ask them to write the main ideas of the article with supporting details. If the unit is a fiction unit, we might ask students to write their ideas about one of the characters from a read-aloud or their ideas about symbolism or themes in the text, whatever matches our focus for the unit. 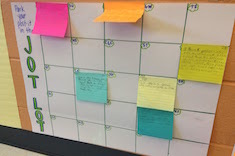 If we want to see how students are doing with using a tool independently, like the Rising Stars of Inference chart we have in our room, pictured below, we might ask them to leave a Jot Lot sticky note for us that shows thinking using the Rising Stars chart and to add the stars at the top of their sticky note to show which column they were using or aiming for. 2. Use the performance assessment to determine areas of focus or goals for the small groups. Once we’ve given the performance assessment, we sort our students’ work into groups that seem similar. We can imagine that some who haven’t tried this yet might feel unsure of finding a group for everyone. Although there are times we choose not to include everyone in a small group, it’s never happened that we’ve wanted everyone to be in a group and have had an outlier who didn’t fit. We have always been able to come up with groups that include everyone and reflect the work our students are currently doing and our ideal next steps for them. We’re sure you’ll find the same when you give this a try. 3. 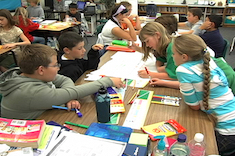 Make a plan for the small groups that gradually releases responsibility. Once we have our groups, we make a plan for small groups that will focus on the same goal across five meetings. We use the planning sheet below. We adapted something we were shown several years ago at a Calendar Day with the Teachers College Reading and Writing Project (TCRWP). Seeing all five days for each group helps us be sure that we’re planning purposefully and in a way that gives them more and more responsibility as each group progresses. Similarly, having a place to indicate how they’ll do the work—guided as a group, with a partner, independently—helps us be sure that we’re varying methods as we’re increasing independence. 4. Decide on the timing for the groups. In units where we want everyone in a small group, we’ll spend the entire week on the small groups and hold them in place of our conferences. This works because students are not in the group for their entire reading workshop period, so they still have daily time to read in their just-right books. Over the course of the small group, we also often have the students move to trying the work in their own books, so we have opportunities to see how work is going in their just-right books just as we would during a conference. 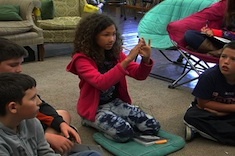 If we decide that the entire class will not be in a small group, then we’ll pull a small group each day in addition to having some reading conferences. This means that the small groups will meet a few times a week, and it’ll likely take two or three weeks for us to get through all five meetings. 5. Give another performance (post) assessment. A huge benefit of these small groups is that the chances for practice with the strategies allow for us to see how their work is progressing toward the group’s goal. That is, we have formative assessment after every group meeting and always end the group with them independently trying the strategy in the most sophisticated way we taught it during the group. They then leave us a Jot Lot sticky note as a more formal post-assessment of their work across the group. We use that final Jot Lot to determine who might need additional days in the small group or more support with the strategy during some conferences. The assessments are almost always encouraging; the majority of our students show independence with the strategy after the five small-group sessions working toward doing the strategy independently. Shana Frazin, a staff developer with whom we’ve worked at TCRWP, says, “Teaching hasn’t happened until learning has occurred.” These small groups, focused on a single strategy across five different sessions, have helped us get past the feeling that we are teaching even if no real learning is happening. 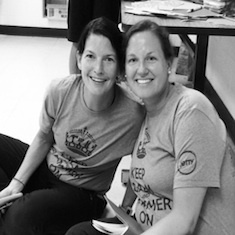 Tara Barnett and Kate Mills share the process of helping students set weekly goals and then reflect on their progress every Friday. Tara Barnett and Kate Mills use a jot lot to turn students’ notes on their learning into instructional plans and assessment.